BIRMINGHAM – The Texas Southern Lady Tigers Indoor Track and Field team competed at the 2013 Southwestern Athletic Conference Championships held at the Birmingham Crossplex. The Alabama State Lady Hornets finished the meet in first place. ASU piled up 218 points, ahead of second place Prairie View who finished with 155. Southern was third with 56 points, followed by Arkansas-Pine Bluff with 54 and fifth place Texas Southern who tallied 52. Mississippi Valley led the remainder of the field in sixth place with 43 points. Jackson State came in seventh with 18 points, Alabama A&M was eighth with 15 and Grambling State 10. 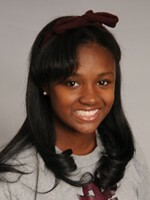 Terralyn Johnson of Texas Southern hopped her way to first place in the Triple Jump 11.82m (38-09.50). Kadijah Gordon of Alabama State also had a jump of 11.82m, but Johnson had all clean attempts. Meet record holder Aisha White of Prairie View finished third at 11.53m.